As the largest independent regional food group in the UK, Taste of the West aim to champion food and drink producers from across the South West region. 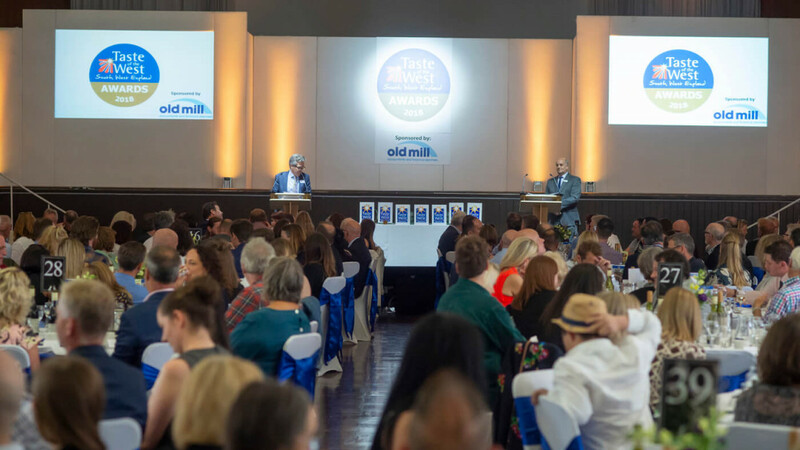 Once a year, members, including food and drink producers, distributors, restaurants, cafes, pubs, hotels and farm shops, come together for the Taste of the West Award Winners Ceremony – an opportunity to acknowledge and celebrate the best of the West. First and foremost organisers needed a venue able to cater for up to 500 people, in a central location, easily accessible for all attendees. Initially chosen for its prestige and grandeur, the University’s Great Hall made the perfect setting. Given the nature of the event, Taste of the West needed to find a team of chefs capable of creating and delivering innovative and inspiring menus, to showcase the phenomenal array of local produce provided by nominees and winners. Prior to the awards lunch, guests were treated to a selection of drinks and Canapés in the street area of the Forum. Delicacies such as Sharpham cheese tarts and pheasant, partridge and mushroom sausage rolls were served up alongside drinks from local suppliers. Guests then made their way to the Great Hall, where elegantly dressed tables, adorned with fresh flower posies added a sophisticated tone to the event. 420 people were lucky enough to indulge in a 5 course menu featuring culinary delights such as mango, ginger and toasted cumin marinated chicken and smokey tomato and garlic confit of turkey, before the awards ceremony itself. Brimming with fresh local produce, supplied by Taste of the West award winners, the lunch was beautifully prepared by the University team of chefs. Given the target audience, this was no mean feat. The awards have been taking place for over 25 years and previously changed venue year on year. Given the phenomenal success in 2017, organisers made the decision to bring the event back to the University the following year. Now in its second year at the University, the Taste of the West Awards have become an annual feature on the Event Exeter programme, with planning well underway for the 2019 event.